We all know that duplicating code is a bad practice. We have to avoid repetitive logic that results in expensive fixes in case a project requirements change. Cost of fixing issues caused by code duplication only increase as the project grows. Problems caused by duplication are commonly understood when we write code, but we usually don’t pay attention to duplication when we build UIs. But duplicating while creating a UI is similar to duplicating in any other context. For example, you might have a project where Helvetica Regular, in red appears multiple times across the project’s UI. You have two options: you can either set the appearance from scratch in every case, or you can copy an already decorated instance from previous layouts. In most cases we go with the second option. This is perfectly fine as long as we stick with this design – but in reality design specifications tend to change over time, meaning that copying an already decorated instance won’t help in the long run. If your client asks for a minor change – to make the text orange, for instance – you’ll end up having to spend hours with a quality assurance specialist doing repetitive and unnecessary work and performing regression tests. Something as simple as changing the font color in an application can end costing a lot of time. So I thought about potential solutions to this problem, and was inspired by desktop publishing systems like InDesign and Illustrator. I decided to create a library that would allow developers and designers to easily create and adjust text styles, absolute and relative text size, and other text parameters. Before decorating any texts, the designer defines a table of styles. Later, styles are applied to specific text fragments. This means that in future the designer only has to change the style attributes, and all texts that are decorated with this style will update automatically. Another important feature of text styles is inheritance. All changes made to “parent” style will be reflected in their “children” if the updated attribute wasn’t overridden. A font is the the most basic component of a style. At the same time, UIFont is not a font in the full meaning of the word. When we say “a font” we actually mean a family of typefaces, but UIFont defines a single typeface of a specific size. When file names that are specific to each font are hidden behind common properties, it’s possible to change the text typeface: for example, to make it light, bold or italic. The result of applying a style to a string is an instance of NSAttributedString, which can be displayed in UILabel, UITextField and so on. With a multiplier, if the text size of the base style changes, the whole text scheme will change too. What can make the text size change? iOS has a Dynamic Type feature that allows you to adjust font size based on device accessibility settings. When you use a multiplier, users will be able to change your font scheme more easily – with just a single slider in Device Settings. Our library also provides a number of other tools, including a simple way to define clickable links, the ability to apply styles selectively to highlighted words, and custom tags parser. Using our library would change the usual workflow for your development team. First, text decoration moves from the Interface Builder to the code itself, which helps us avoid duplication. With a change to just a single line of code you don’t have to worry about updating storyboards, which usually results in multiple bugs. 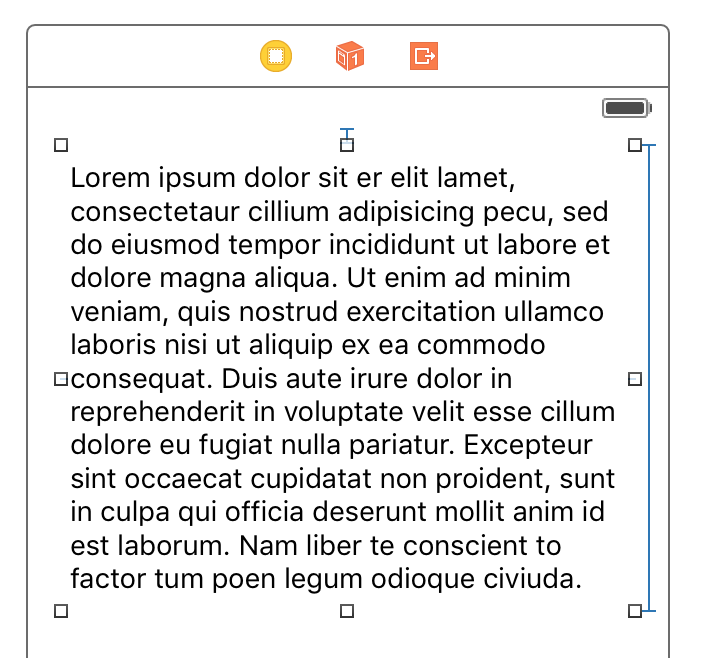 The work in storyboard can be done in seconds, and the whole layout consists of a single text view. Normally, text in design specifications looks like a boring list of numbers that are difficult to remembe. But HandyText specifications adopt a more human-readable format. There could be cases when a specific piece of text has a unique style that differs slightly from the base style. For example, it’s traditional to highlight an error notification by putting it in red. HandyText library is a free tool that can save you time at every development stage. It offers designers a more flexible way to describe text parameters, and helps developers save time when creating and modifying layouts and performing regression testing when design specifications change. Check out all the details of HandyText library at my GitHub account.